PSO advertises that customers can elect to join "WindChoice". The extra cost is stated to be $1.72 per 100 kilowatt-hours. This is 1.72 cents per kWh. My metered usage was 1,306 kWh, so my average cost per kWh was $107.60 / 1,306 kWh = 8.24 cents per kWh. Now, you would think that the bill would increase by the ratio of the WindChoice cost (1.72 cents) by my current cost (8.24 cents), which is a 20% INCREASE in my power bill. HOWEVER, what is this "Fuel Rate" adjustment that deducted $23.11 from my last bill? 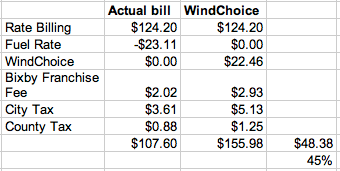 To answer that, I went to the PSO WindChoice FAQ "How will WindChoice affect my monthly PSO bills?" and "How does the WindChoice program affect my fuel charge?" It turns out that if I chose WindChoice, that power would not receive the "Fuel Rate" credit, as shown in PSO's answer. So, with this information, my power bill last month would have been 45% higher if I had chosen WindChoice. That's not economic and therefore that is not practical environmentalism.